WHAT: Make Father’s Day extra special with a visit to the newly named ICON Orlando! 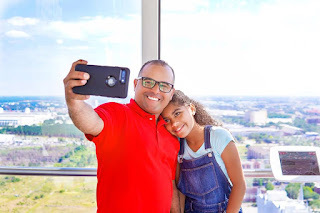 Guests can now book the “ICONic Dad” package for just $139 (plus tax). The package includes a private family capsule for up to four people (additional tickets available for $20 per person plus tax, limit up to 4), a craft beer flight for dad featuring Orange County Brewers, a soda float bar for non-alcoholic options, tailgate games for the whole family to enjoy and priority boarding! Children under 3 and parking are always free. Located at ICON Orlando 360, in the heart of the International Drive district, ICON Orlando makes a statement as the tallest observation wheel on the east coast of the United States soaring 400 feet. Guests are effortlessly lifted to experience breathtaking 360-degree views of the Central Florida landscape, creating iconic moments with every flight. Each capsule contains Apple iPad Air tablets which allow visitors to explore and learn more about the landmarks and surroundings in several languages and effectively see beyond what the eye can see. A flight on the ICON Orlando soars high enough to see the sights of downtown Orlando’s skyline, nearby world-famous theme parks, beautiful lakes and lush landscapes, with views all the way to Cape Canaveral on Florida’s east coast on a clear day.